Prof. R.Y. Deshpande has been at the forefront of the intellectual rebuttal of Peter Heehs’s mischievous book on Sri Aurobindo. His site Mirror of Tomorrow thoroughly exposed the misrepresentations in the book and drew a number of intelligent netizens from various parts of the world into the often lengthy discussion that followed some of his postings. The site has certainly carved for itself a spiritual/cultural/scientific niche which fulfils the need of a mature readership. Prof. Deshpande was formerly the editor of Mother India (a monthly English magazine of the Sri Aurobindo Ashram) from 1996 to 2004. He resigned from the Mother India because his freedom of expression was curtailed by Manoj Das Gupta, the same person who now so sanguinely defends Peter Heehs’ freedom of expression to denigrate Sri Aurobindo from within the Ashram. The same Managing Trustee has recently issued a show cause notice to Prof Deshpande for daring to criticise the Trustees in a public forum. Is there not something obviously wrong about the Managing Trustee’s stand and does it not show double standards? Freedom of speech for Westerners (especially Americans with the conscience of taxi drivers like Peter Heehs) is allowed – I suppose they have to be treated like newborn babies who have to be pampered even if they bawl and spoil the floor of the house. But no freedom of speech for erudites like Prof Deshpande – they have to be suppressed, knocked down, relieved of their work and perhaps even expelled from the Ashram. In October 2010, Prof Deshpande was removed from the Ashram School where he taught physics from the last thirty years. A long list of qualifications adorns his C.V. file: He worked in the Tata Institute of Fundamental Research, Mumbai (1955-57); at Bhabha Atomic Research Centre, Mumbai (1957-80); at the Lawrence Berkeley Laboratory, Berkeley, California USA (1964-65); headed several Atomic Energy and Space Projects in Advance Technology, apart from being the Examiner for a number of PhD theses in the field of Solid State Physics. He left all these to serve the Sri Aurobindo Ashram, where he became a prolific writer and poet. 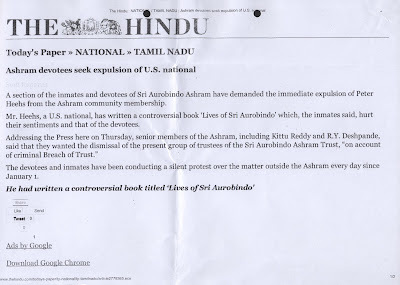 He is well-known for his scholarship on Sri Aurobindo’s epic poem Savitri and was one of the members of the team which finalised the 1993 edition though he strongly disagreed with the editorial decisions taken by both Amal Kiran and Richard Hartz. At present he runs the site http://www.savitri.in/ where he plans to present the various editions of Savitri along with articles, books and other related material useful in order to understand the epic poem. 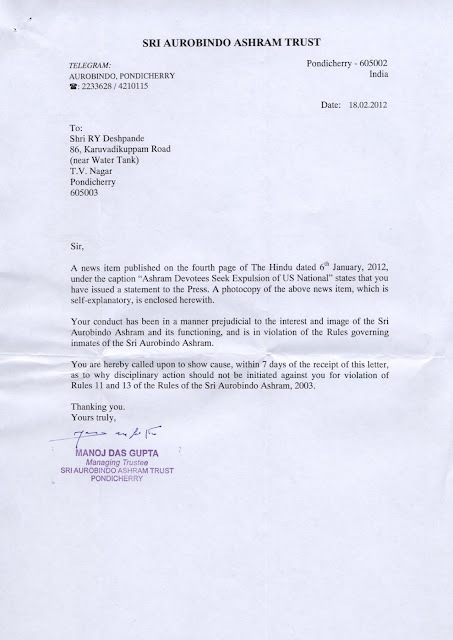 We reproduce below the show cause notice of the Trust dated 2 March, 2012 to Prof Deshpande and the correspondence that followed between them. Your letter dated 18 February 2012 addressed to me. It states that I “have issued a statement to the Press” to which you seem to be having some objection. In this regard may I request you to make me available a duly endorsed true copy of the said statement, a statement bearing my signature on it? On receipt of the same I will immediately send to you my letter of resignation, ceasing to be the member of the Sri Aurobindo Ashram. If I fail to get it from you within seven days of this letter, I will treat you having withdrawn yours sent to me. In view of the enclosure (b) noted above which you have yourself sent to us, we fail to appreciate the import of the second paragraph of your letter dated 21.02.2012, namely "I request you to make available to me a duly endorsed true copy of the said statement, a statement bearing my signature on it…." It goes without saying that in case you have given any signed statement to the Press and which you have not submitted to the Trust, you can access a copy of the same only from those to whom you had submitted the same. Kindly note that a statement can be either oral or in writing. We fail to understand as to how we are supposed to give you "... a duly endorsed true copy of the said statemen, a statement bearing my signature on it..." when it is your statement provided you had issued a written one. In case the statement to the Press was an oral one, it is once again only up to you to say whether you had made it or not. Please bestow upon our letter dated 18.02.2012 the attention it deserves and kindly send a proper reply to the issues raised therein. Sub: Your letter dated 2 March posted on 5 and received by me on 7 March 2012. This is in response to my letter dated 21 February 2012. I am sorry to say that your letter fails to answer the basic point I had raised in mine. You had attached a Press clipping to your first letter, of 18 February; but this Press clipping does not expressly mention anywhere that I, RY Deshpande, had issued any statement to them, to the Press. Instead, it is you who are writing to me that I had “issued a statement to the Press”. Presumably you would not be doing so unless you would be having documentary basis to do so. But now it seems that you have none. Please understand that you are sending a show-cause notice to a specific individual. Obviously what is expected is that it is supported unambiguously by something in your hand vis-à-vis that individual. But what we see here is only a general news item in a newspaper, it speaking of several things in one single hurried pauseless breath. No competent administration will ever rush to take any action against anyone just on the basis of a newspaper report, without making thorough internal inquiry. This internal inquiry, involving me also, has not been done before you shooting out the notice to me. Besides, you are obfuscating the issues. But your rushing to take such actions comes to me in the least as a surprise. It had happened twice about a decade ago when I was looking after the editorial work of Mother India; then again a year and half ago, when I was giving classes in Knowledge. On one occasion the Mother found the Mantra of Life. Théon was watching her during the process. The Mantra was sealed in a case with the Mother’s name in Sanskrit written on it. She started describing its character to Théon. Théon got interested in it and wanted her to break the seal. But she refused. She was prompted by something in her not to do so. Théon became violent and cut her life cord malevolently. But she returned by exercising her will and with the help of the power within her. She said that she had something on earth to do and hence she would not go away in such a manner. She always had the Divine’s Protection in all the circumstances. We all know how Sri Aurobindo protected her against a hostile force in 1938, resulting in his accident. Later, the Mother found the Mantra of Life again and gave it to Sri Aurobindo. It is said that Théon was the Asura of Death and therefore his interest in the Mantra of Life is perfectly understandable. It seems he wanted to marry the Mother which, of course, she promptly refused. Just imagine the calamity that would have befallen in the eventuality of her consent! You have taken this reported statement of the Mother to throw me away from Mother India; later you maneuvered, practically in a similar manner, to throw me away from the Centre of Education where I was teaching for thirty years. 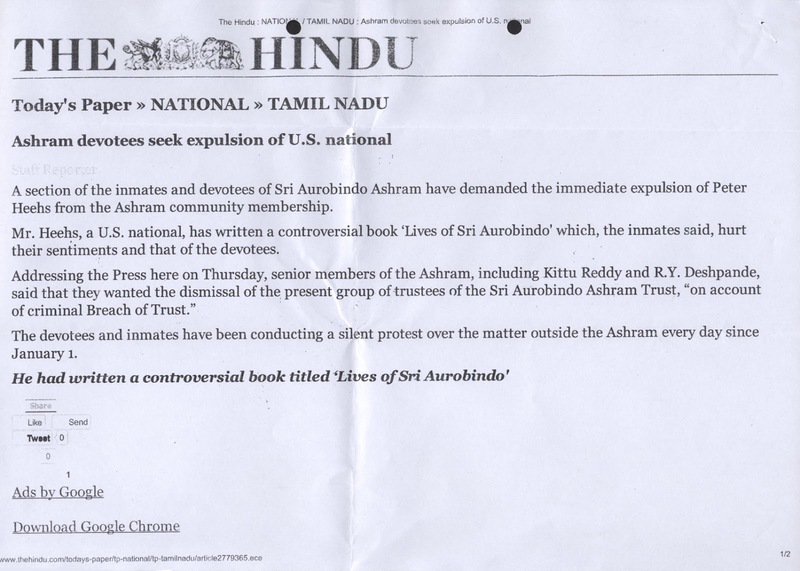 But now you have a strange logic to set aside this statement of the Mother in the case of the author of the offensive and distasteful Lives of Sri Aurobindo, a biography published in May 2008 by the Columbia University Press, and for which you have given the copyright permission. The biography speaks of the romantic relationship between Sri Aurobindo and the Mother, and you have no objection to it, an inmate of the Ashram mischievously and publicly writing these obscure things. Not only no objection; you go all the way out to support the visa application of the said author by saying that he is rendering “invaluable services” to the Ashram. The biography is not only denigrative; it is full of distortions and falsifications. If I write or speak about it you rush to gag the freedom of expression, as you have done in a few cases. You have not, for instance, published two of my articles given to you for putting in Mother India; this was more than three years ago. The misrepresentations present in The Lives of Sri Aurobindo are what I have shown in them. Why? What else can I say if this is not perversity? These journalistic blogs conveniently keep aside all that goes against their idée fixe. Indeed, these give the impression of having been planted or sponsored or commissioned by the authors concerned. It is a sad tale that journalists lend themselves to these methodologies. The important point is, The Lives of Sri Aurobindo is a motivated work and therefore lacks objective scruples. The author with all the archival resources at his disposal—denied to other researchers—has used half facts and in the other half twisted them to suit his intentions. There is constant falsification, there is misrepresentation. It is these which cannot go unchallenged, and in them it is absurd to speak of “frailty of faith”. Where does faith come here in the picture? Just to give one example, the author of the Lives dismisses Sri Aurobindo’s “main work” Savitri as a “fictional creation”. Even for the sake of argument if it is so, he has not built up a rigorous thesis to arrive at this conclusion. It is such things which make me wonder at the wisdom of our wise journalists. Who would care for their writings except the gullible and those who have axes to grind? Yet may I expect the author of this post to go through the entire book carefully and arrive at his own conclusions without using the material supplied to him? In fact the question I would ask him is: Has he read The Lives of Sri Aurobindo? I doubt. The intention is to halt the kind of disinformation about the Mother and the Master which systematically goes around in the media and in the public places; one cannot be a passive witness if one has some sensitivity, some understanding of things that are in Sri Aurobindo’s affirmative dynamism of life. This also means that, you cannot in your puffed-up imperious manner stop others speaking against an injudicious book. But let me just say what I had said earlier in one of my letters to you, that you are crudely personalising these matters, that you are simply wasting your time and consciousness; I will add one more thing though, that in addition to time and consciousness, you are also squandering the Mother’s precious money, for instance by writing such letters. As an inmate of the Ashram, and with my pretty long association with it since 1950, I feel much concerned in this regard and strongly consider it obligatory on my part to bring it to your attention. I would like to say that you are carrying out management of the Ashram in a most un-Aurobindonian manner, quite lacking the vision for which the Institution stands. Let me also assert here that this letter of mine is without any prejudice to my rights and remedies available to me in several respects. To summarise my response to your notice I will simply say that it is factually baseless and instead is prejudiced, malafide and arbitrary. I must also say that you have been habitually autocratic, unprincipled and arrogant as is indubitably evident from your past acts.